We put quality tuna in our recipes not only because cats love it but also because it is a great source of natural protein, vitamins and minerals, and by the time we have cooked it in our delicious jelly, it tastes great too! Gelling agents – (Guar gum, Cassia gum, Kappa carageenan, Water) 55.8%, Animal origin - (Tuna red meat) 42.0%, Soy bean oil 1.5%, Vitamins and minerals 0.7%. 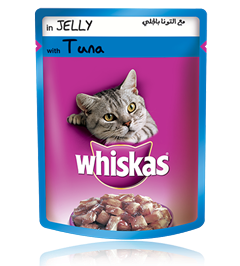 Whiskas® pouch with Tuna in Jelly is formulated to meet the nutritional levels established by the AAFCO cat food nutrient profiles for growth and maintenance. Please serve on the basis of 1 pack/ 1 kg body weight. Recommend to feed twice a day You can increase or decrease the daily amount according to your cat’s activity level. Crude Fat 2.0% min, Crude Protein 9.0% min, Crude Fibre 1.0% max, Moisture 87.0% max.